Powers: Nemesis possesses no superhuman abilities, but wears armor that enhances his strength, protects him from most injuries (including shotgun blasts), flight via jet boots, and allows him to channel electricity through his gloves. History: (Falcon#1)- Mr. Kane, owner of Kane Construction, was responsible for a new housing project in Harlem, and had gained a reputation as a slumlord for using second-rate building materials. Secretly, his plan was to destroy the building and collect the insurance, using a suit of armor he had stolen from the Brand Corporation. Using the alias of "Nemesis," Kane began his one-man wave of terror, and came into conflict with policeman Sgt. Tork and the Falcon. 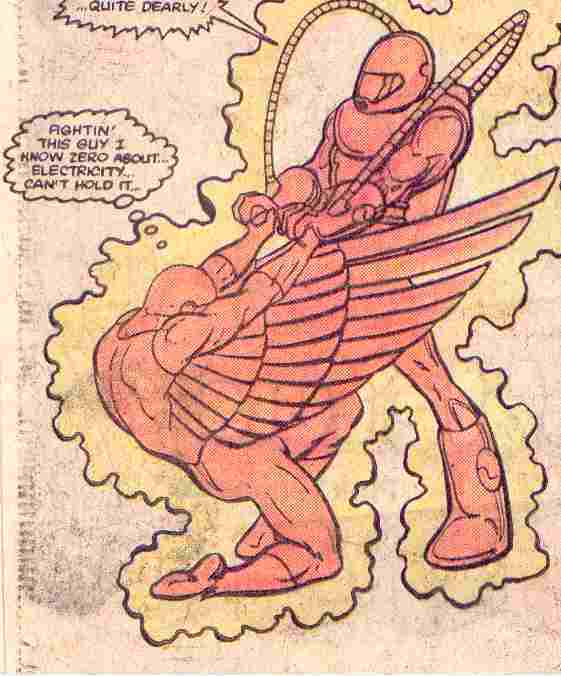 In their first encounter, Nemesis nearly killed Falcon with an electrical surge, but fled when the police arrived. As Kane donned his armor a second time, he was observed by a teenager, Miguel Martinez; Kane tied Miguel to the building with dynamite wrapped around his chest. When the Falcon found what had happened to Miguel, he removed the dynamite and threw it at Nemesis. While he tended to Miguel, Kane went on the lamb. His armor badly damaged, Nemesis commandeered a subway car to make his escape, but the Falcon remained hot on his trail, foras Nemesis suddenly realizedRedwing had been trailing him the whole time. No longer able to put up a fight, Nemesis was easily beaten and unmasked by the Falcon. In the aftermath, the building projects were abandoned. Comments: Created by Christopher Priest and Paul Smith. His first name was revealed in Falcon's entry in OHotMU A-Z Hardcover#4. All characters mentioned or pictured are ™ and � 1941-2099 Marvel Characters, Inc. All Rights Reserved. If you like this stuff, you should check out the real thing!